Bagels, I want bagels; chewy, flavorful and gluten free. Not tasteless, sponge-like icebergs like the ones they sell in the freezer case. But, fresh real bagels that are safe for me and anyone else with celiac disease. So I finally tried to make them myself. First try, success for most part. Full of flavor and texture. Yummers! I made one batch; makes six large bagels. The blend of several gluten free flours and the long cool refrigerator rising gave them great flavor. Mine were a bit saggy, a tad deflated! And not as pretty as the bagels in Nicole Hunn’s cookbook and one of mine broke in half in its bath. Yes, in the bagel bath! 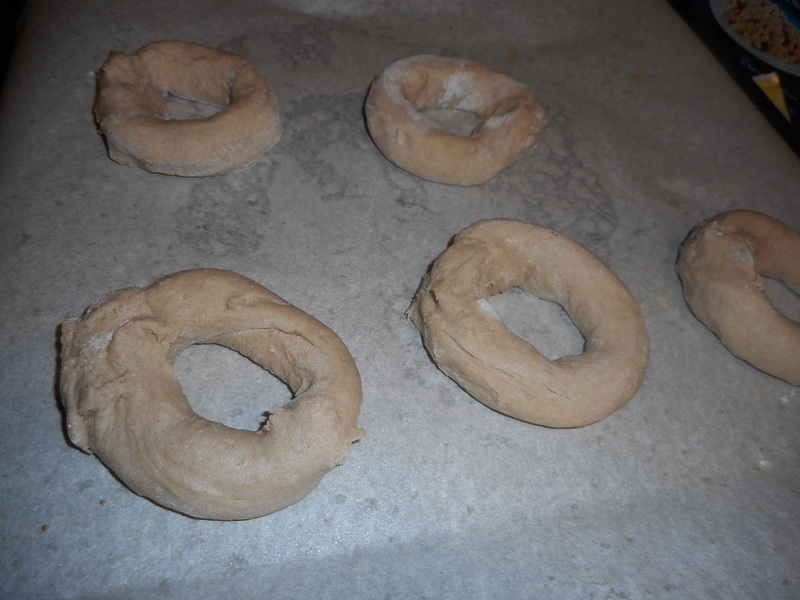 Bagels get a quick dip in a molasses and salt flavored hot water bath before baking. I baked my batch 5 minutes longer than the recipe as they didn’t seem quite done at 20 minutes. Next time I will make sure I connect the two ends firmly so they can’t come apart no matter how clumsy I am at turning them in the water bath. 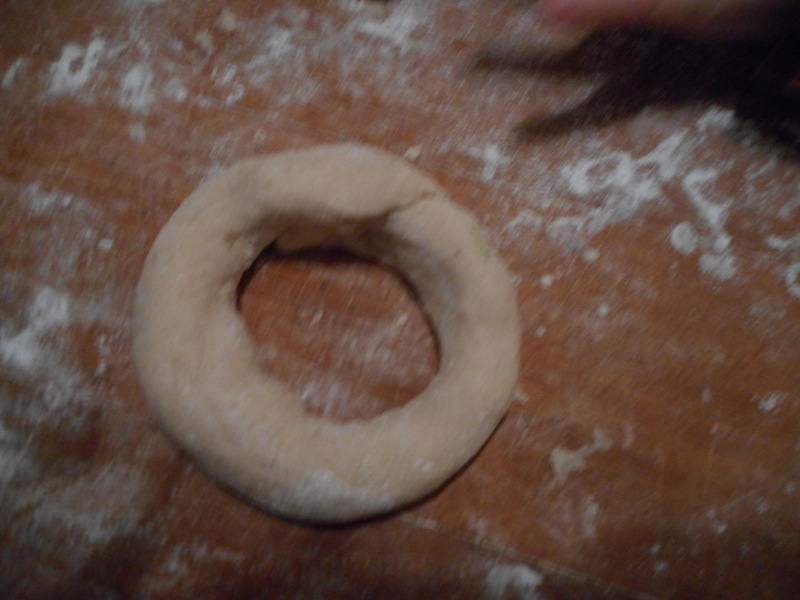 The dough gets rolled into a fat snake that you join into a donut shape before letting them rise for an hour. Then their bath and bake and bagel heaven is yours…..
Now, this recipe is not one I created, you can get it from the cookbook, Gluten-Free on a Shoestring Bakes Bread, page 126. Nicole Hunn is a genius at baking gf breads. Please follow her recipes closely and you gotta use her special gf flour blends; just make the blend up from recipes provided in her cookbook. The secrets include using some unorthodox ingredients like pectin and whey protein isolate. The whey is very pricy and you need a fair amount of it. I don’t bake her breads that often as I find the flour ingredients not that cheap. But, I love her rolls fresh out of the oven, almost wheaty in texture and flavor. So well worth a go. Not bad for my first effort at bagels. I took pictures as I went but in my excitement I forgot one of them bathing! Aiden got his fingers in one of the shots; he was standing on a stool watching me shape them. I had to take him home before they were done rising, he was pretty disappointed not to have a bagel to munch on tonight. 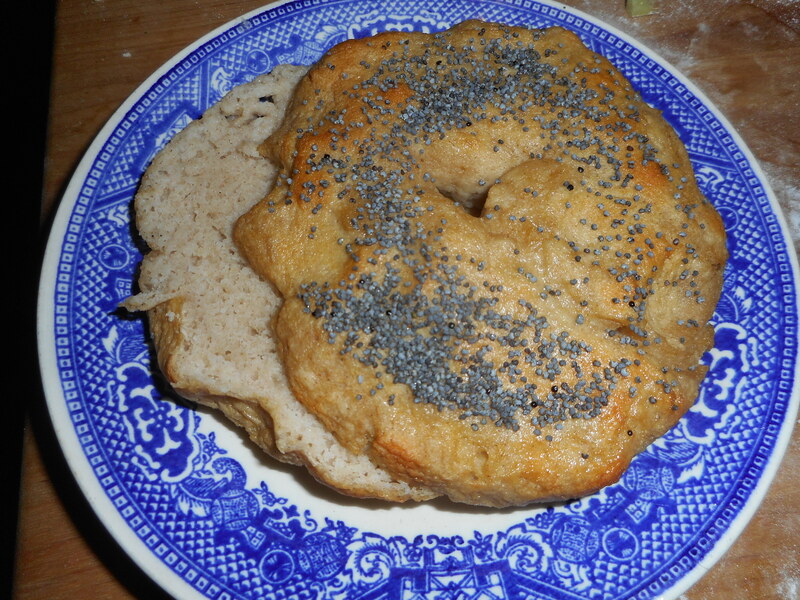 Nicole is not happy if other bloggers repeat her recipes therefore I will not provide it here; visit her website where you will find the whole grain bagel recipe: glutenfreeonashoestring.com, you might well return to attempt her other tempting baked goods. I make things out of her cookbook regularly, some tasty cake recipes in there. 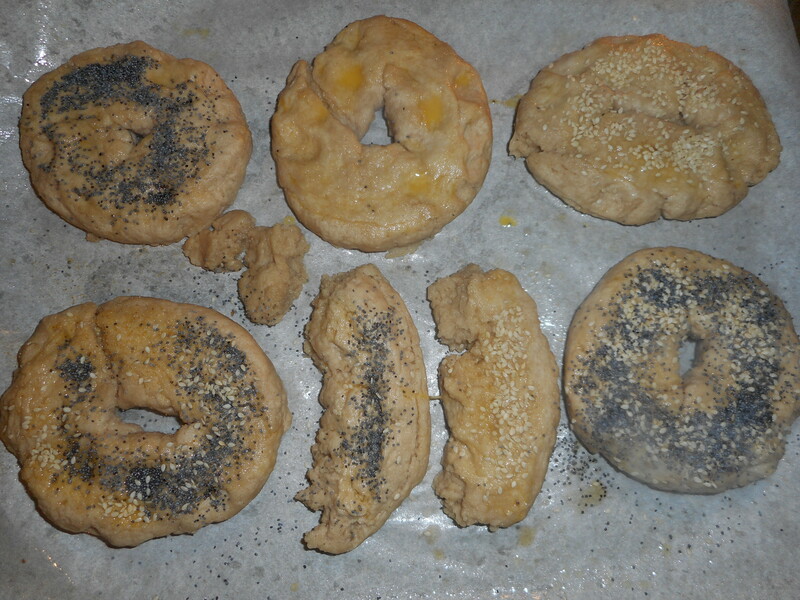 My homemade bagels are a great treat, several will go in the freezer to be consumed later as I am scared they might spoil before I can eat all six. I sprinkled one with lots of sesame seeds and two with poppy seeds, two with both and one plain. Do try them if you are yearning for a bagel with bite, one with some real yeasty flavor and you can add the toppings of your choice. I am thinking about getting some onion bits for a topping; wonder if anyone makes them gf? Worth a look for said freeze dried bits. This recipe is a keeper. No more dreams of bagels, I have the real deal in my kitchen…at last! Day two of this storm, or is it day three? Hah! Anyway, time for another hearty one pot meal. 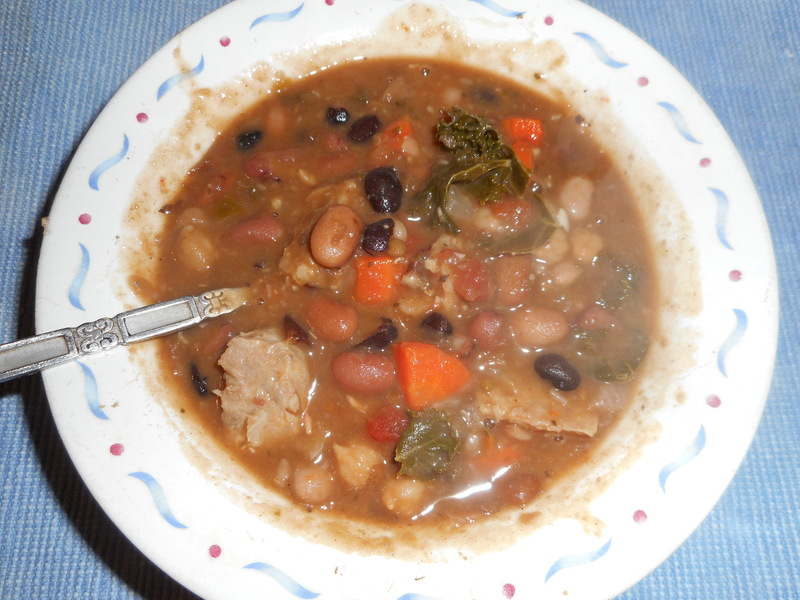 This one is my multi-bean soup with Italian sausage. I started with a 1.3 lb bag of 4 bean mix and added two kinds of lentil and a bit of a few others. The critical thing is that, if you have celiac, most 16 or 15 bean mixtures for soups contain barley which we are hugely allergic to. After much searching I found a four bean mix out at Echo Hill country store (Berks County) and added some French lentils; maybe ¼ a cup and some red lentils; another ¼ cup plus a ¼ cup of dried garbanzo beans and a sprinkling of dried limas. 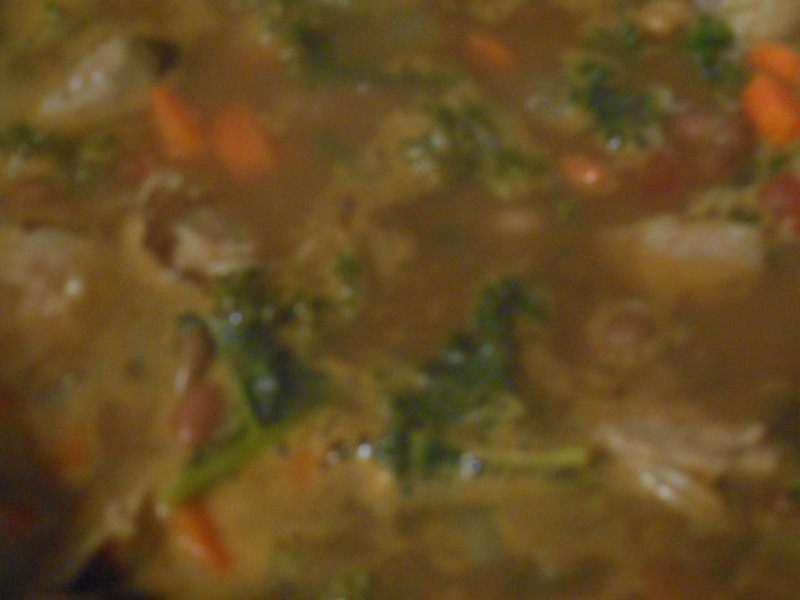 You can use what ever blend you like but I like a good mix for a rich thick stew. Let me know if you find any other mixtures that are barley free. My soup has Italian sausage but you can leave that out if you want a vegetarian version. Ditch the bouillon cube if you are going that direction. I personally love sausage in a bean stew. Gives you lots of meaty flavor and a healthy dose of protein. I am guessing you could use other things like smoky ham chunks or maybe a ham hock? I enjoyed a hot bowl of this potage with a slice of toasted multigrain gf bread. It made a full meal without anything else being necessary. A fresh crunchy salad would go well if you want to round your dining experience out with some greens! Soak 1- 1/12 pounds of dried beans in water to cover. I set the lentils aside and added them after the soaking as they don’t need the same treatment the other beans need. Either bring to a boil and let stand an hour or just let stand in the cold water overnight. I did the quick version! 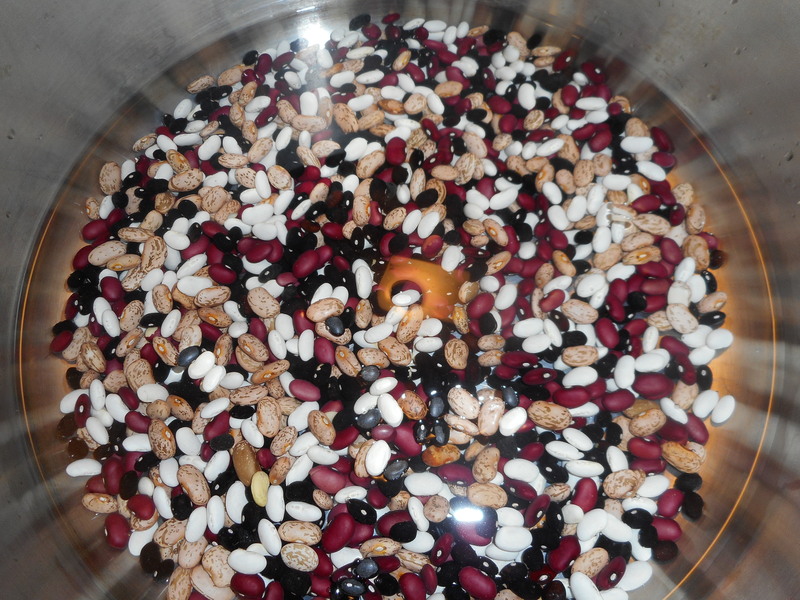 Drain them well and rinse even better before returning the swollen legumes to the rinsed pot. You want to get rid of the soaking liquid as it is full of the stuff that causes intestinal gas so rinse dem beans! Cover with fresh filtered water, an inch or so above the beans and add a bay leaf. Cook 1 hour, pour in more water as needed and stir so it doesn’t stick or burn. 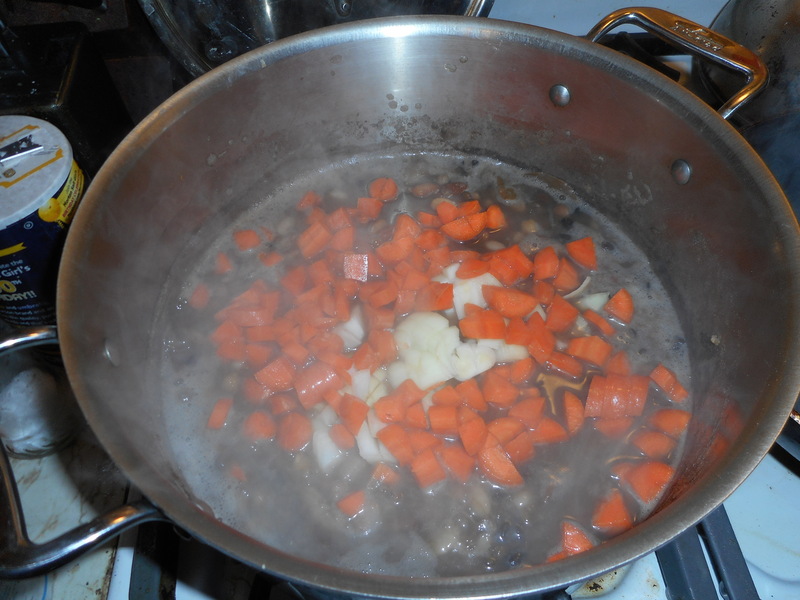 Then, add the lentils and cook another hour until the beans are nearly tender. It is hard to say when beans get done, depends on a number of factors including the age of the beans, I taste often to check for tenderness. And stir that pot! As they are approaching that almost done spot start the rest of the dish. Add the veggies, stir and cook 10 minutes. Stir occasionally. Add water if needed. I like the soup thick but it can’t be solid so add water. As that cooks start the sausage. Sauté one lb Italian sausage: brown in a Teflon pan with a touch of olive oil until top and bottom are browned and sausage is mostly done. 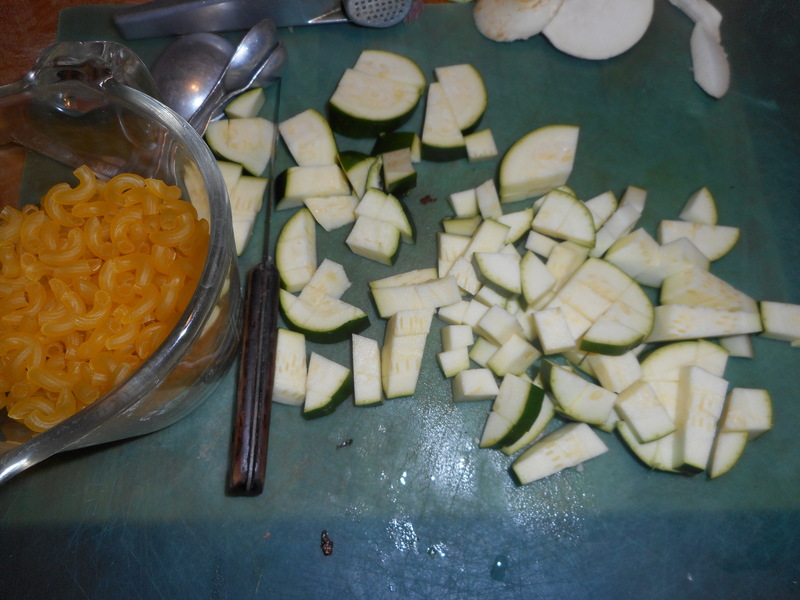 Let cool a bit and slice into rounds or chunks, set aside. 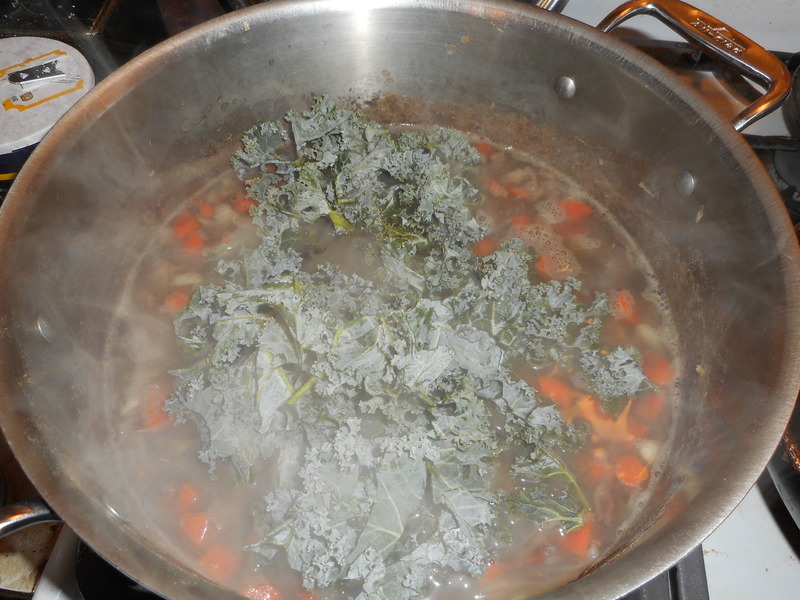 ½ bunch of kale leaves cut into big shreds; I cut off the bigger stems as they can be tough. Cook ten minutes, add more water if it gets too thick. Stir occasionally. Taste and add more spice if you think the soup needs more. Add the sliced sausage and cook five minutes more. Taste and add more salt/pepper as you see necessary. Let stand 5-10 minutes before ladling out. Now that is comfort food that is good for you too! Pasta e Fagioli meaning Pasta and Bean Soup, Fantastico! The soup I love to serve in the dead of winter is pasta fagioli meaning pasta and bean soup, Neapolitan style. It is full of veggies and flavor. Not to mention beans and pasta. Yes, I make it now with gluten free pasta, same recipe as always. I use elbow pasta by Barilla; great flavor and held its shape well. Try not to overcook it though as gf pasta goes from done to mush easily if you are not paying attention! This rib sticking soup will be a meal if you add a salad and a slice of gf bread. I made it for my family the other week with a lovely new bread recipe which I will have to share sometime soon. It was a big hit. Warm, flavorful, satisfying and sure fills the tummy. I made it with dried beans I soaked overnight and cooked until pretty soft. 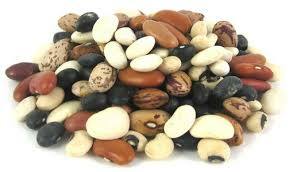 White beans work too, navy beans come to mind as suitable. My version has lots of veggies; if you don’t want them all; leave some out! 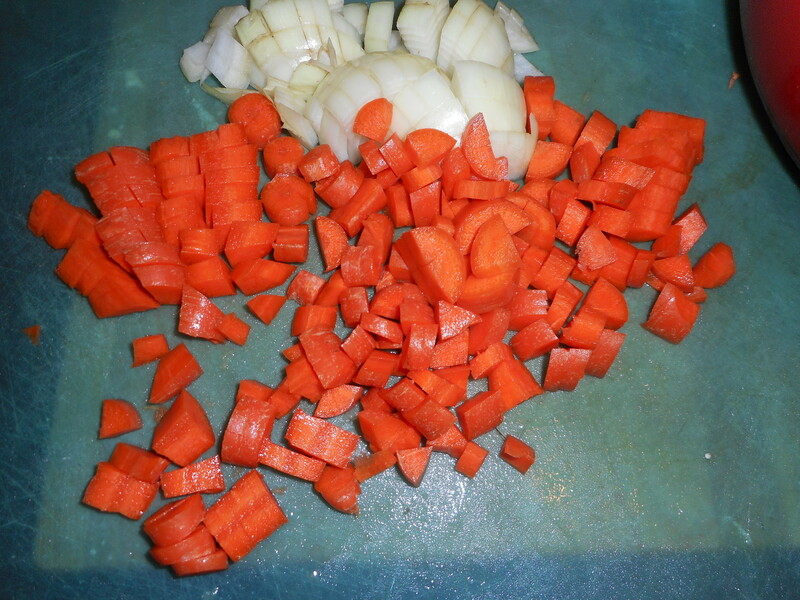 My secret weapon: I use small cubes of turnip as they hold their shape well and add a subtle tasty flavor to the soup. No one ever guesses they are in there; looks like cubes of potato. Or add more veggies, what is in your fridge? I have used green beans, summer squash cubes or peas. I always add a cheese rind saved from a chunk of Parmesan cheese. It really ups the flavor of the soup. And if you get a bit of it in your soup bowl the oozy cheesy goodness will be your prize! 1 lb of dried cranberry, navy or kidney beans, soaked overnight in lots of filtered water. Be sure to pick over them for foreign objects. Drain the soaked beans, rinse well, return to cleaned pot and cover with fresh filtered water, add bay leaf and cook 1-2 hours until soft. Add water if it gets low. Turn off and let rest while you make soup. Heat EVOL in big sturdy soup pan, I like a thick bottom to keep the soup from burning easily. Add onion and cook 5-6 minutes, add garlic, stir and cook a minute, add prosciutto which you have diced up into small squares and the parsley. 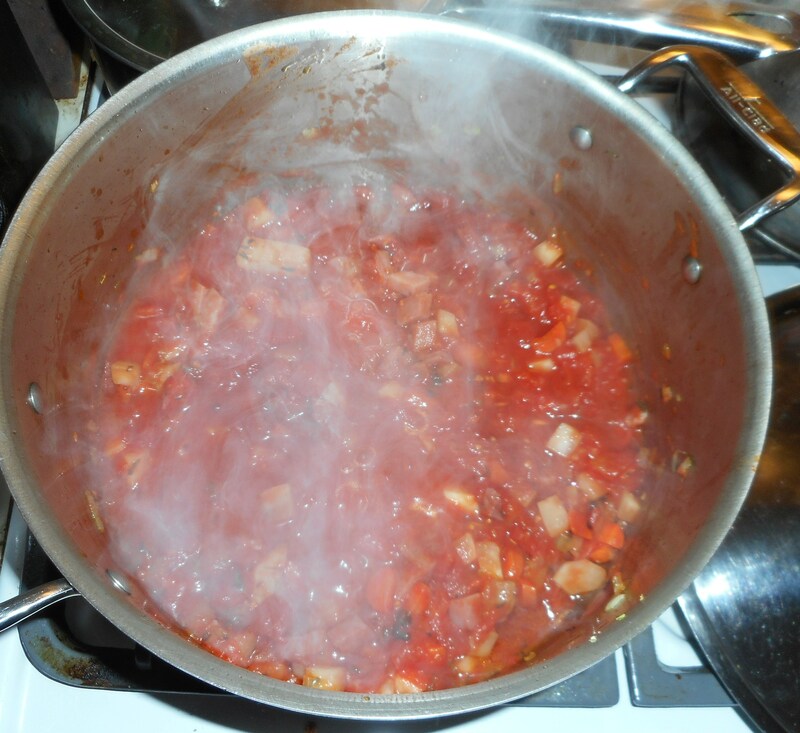 Cook for a couple minutes, add the tomatoes, tomato paste, carrots, celery, turnip, hot pepper and stir well. Add a tsp. of salt. Cook uncovered about 12-14 minutes. Add any bean water in the pan. I often end up adding 1-4 cups of water during this point if there is no bean liquid. Mush up half the beans in a food processor or with a potato masher. Add to soup. Stir well, reheat and cook 5 minutes, add rest of beans, stir, reheat and then add the pasta. Cook just the length of time the box says, stirring it every 2-3 minutes. Taste and add more salt if needed and some fresh black pepper. You can add more parsley if you like. Turn off and let stand 10-20 minutes before serving. Don’t serve it boiling hot from the pot! In summer time I serve it closer to room temperature which is lovely too. I sometimes drizzle some best quality EVOL on the top of each bowl before digging in. We gobbled up all the soup and I totally forgot to take a picture of it in a soup bowl. It was that good! Picture taken and posted after the next batch! Everyone loved that winter fruit tart I made 2 weeks ago so I decided to try a slight variation on it; individual tarts created in low sided round tartlet pans, they have a removable disk bottom for easy removal of each tartlet. I used some frozen blueberries instead of the pears plus I added a touch of ginger to spice it up differently. If you are a ginger hater, just leave that out. They turned out really tasty, I used my favorite crisp cookie crust covered with a mixture of fruits and the touch of crumb almond topping. We each had our own tartlet slightly warm with a scoop of vanilla ice cream; perfect. Joe said that he really loves the cookie crust; great cookie flavor. This is a simple recipe; toss the fruits with sugar and a touch of tapioca. If you don’t have tapioca use some cornstarch or rice flour mix. They look like I bought them in a bakery. I took one to a church event so I would have a safe treat to enjoy and was envied by all the others at my table eating commercially made wheat based pastries. Serve these tartlets and I promise you no one will even believe they are eating gluten free! Start by making a gf cookie crust and the crumb topping. 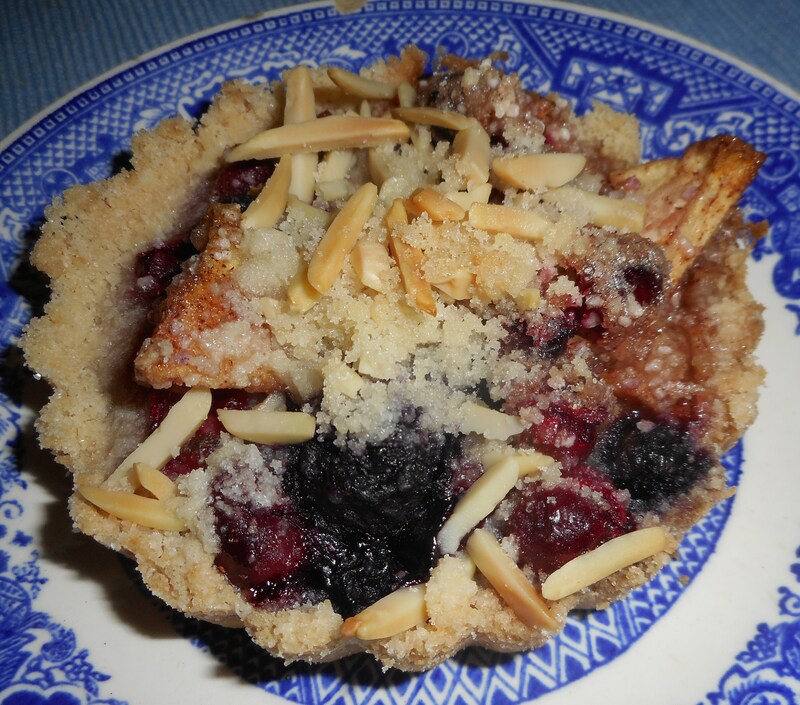 If you have leftover crumb topping in the fridge you are ahead of the game for making pies and tarts! Mix well, add 5 tbsp cold butter, cut into 6-7 chunks. Mix on low until the butter is just crumbs blended in. Add 1 tsp. vanilla extract and 1 tbsp water. Blend well. I love these little tartlet pans made by Chicago Metallic. Pour the crust crumbs into six mini tart pans or a ten inch tart pan that was sprayed with cooking spray. Spread it up the sides ¼ inch (½ an inch for the big tart pan). Press gently in so it is a cohesive crust but do not press really hard or your crust will be like concrete when the tartlets finish baking! Put all four ingredients in the same mixing bowl you made the bottom crust in and mix well with mixer paddle until crumbs form. You will use a ½ cup of the crumbs. Put the rest in a tightly sealing glass container and store in the fridge for your next pie/tart. It should keep for several weeks. Heat the oven to 375 degrees while you make the filling. Peel, core, quarter and slice thinly the cooking apple, put in a mixing bowl with the blueberries and cranberries. Be sure to pick over the cranberries and remove any soft or iffy ones. Add the sugar, tapioca, ginger and cinnamon, mix with a spoon. Pour into the crusted tartlet pans. Mound up a bit; it will sink when it is cooked. 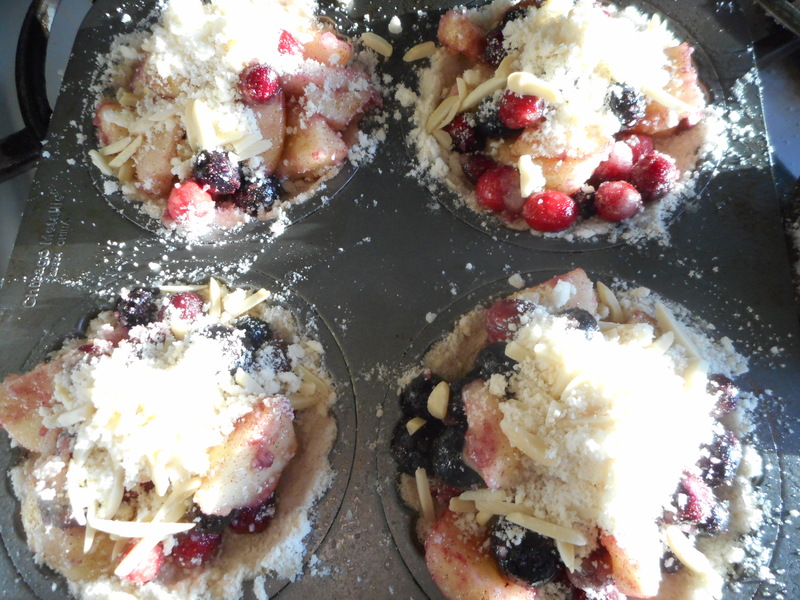 If you have any leftover fruit; you can bake it in an oven safe dish with crumbs on top. Sprinkle the tartlets with the almond crumb topping. I put the pans on a baking sheet for easy placement and removal from the oven. Pop the tartlets in the oven and bake 40-45 minutes or until bubbly and lightly browned. They take that long because the blueberries are frozen. Cool at least 10 minutes. Serve warm or cold. Enjoy! 2/3 c potato starch – Not potato flour! Where to put all those bags of freaky flours? So many kinds…made of grains I never even heard of before…so how to properly store them? I did some reading in various cookbooks and celiac informational books on this issue. Some need to go in the freezer; so I now have a long row of bags tucked in my freezer and a number of glass or heavy duty plastic canisters and jars about the kitchen. For sure you should freeze the brown rice flour because it has rice bran which spoils much faster than processed white rice. I have sweet brown rice flour which is in the freezer too. I also put my almond flour, coconut flour and teff flour in there as well. In the fridge I put the potato starch which apparently needs the cooler zone of a refrigerator. Some just need to be in a sealed jar; amaranth, white rice flour, quinoa flakes and tapioca flour. Be sure to label each item carefully as they look a lot alike. Cornstarch is already in a box…I am buying a lot of that these days…. And then there are the flour mixes. For my favorite new cookbook I created a bread flour mix canister and a brown rice flour mixture used for most everything else: two big jars. And I found a great recipe for baking powder biscuits. It has its own dry ingredient mix, was out of jars so it is in a freezer zip bag; won’t keep outside the freezer for long. Then there is the four flour mix which is basic to my new bread baking book, yet another sizable canister. And, you will need to carefully label each mixture; I like to put the name of the book it is from to help me remember exactly what recipes it is meant for. So I needed like 4 canisters for flour mixes I am using now and frankly there are several other mixes in the bread book that I want to try out… Oyy, where will I store all those jars? When I bake a batch of cookies, they need to be placed in my big cookie jar as soon as they are completely cooled. I never used that cookie jar for its named purpose before but it is totally necessary for storing GF cookies if you want them to stay fresh tasting. To keep for more than 3-4 days: freeze them in a heavy duty plastic freezer bag. Same goes for muffins, yeast bread, quick breads and what ever else I bake. These GF baked goods do not keep as long as wheat breads and cookies. 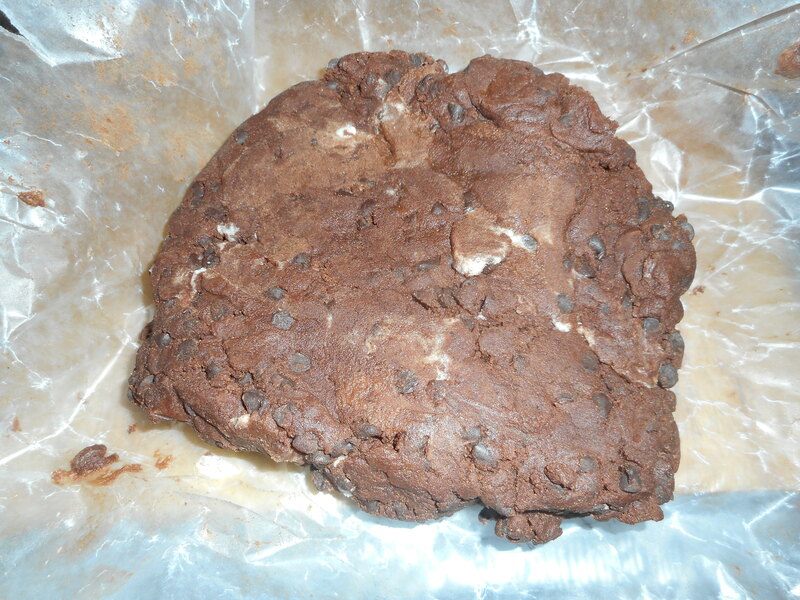 It is very convenient to pull out a cookie from the freezer and munch on it after school. And I love having some slices of sandwich bread in the freezer ready for making lunch in the morning. Always label the frozen stuff and date it -just makes things simpler in the long run. The almond biscotti I made last week is still tasty. The basic nature of biscotti is that it is rather dry and I suspect this is why it keeps so well. It is in a Tupperware which is great for storing biscotti. I also have a bread bag; it is woven fabric and has a plastic bag liner. My sister gave it to me years ago. 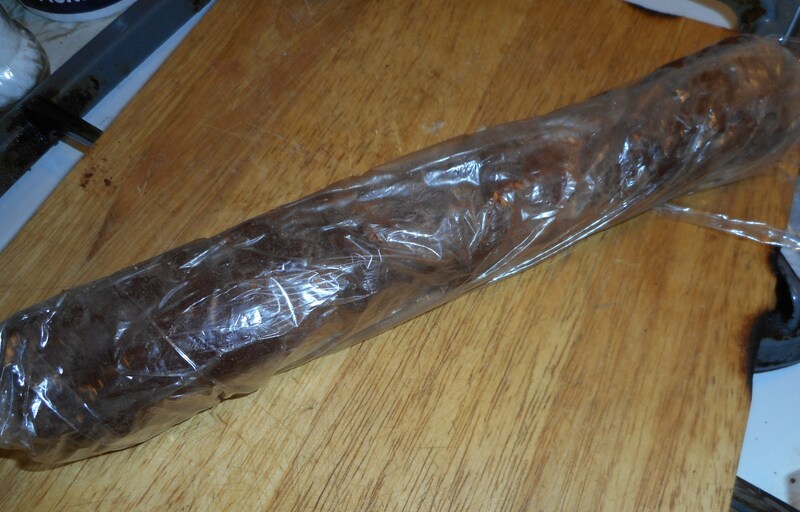 I love it as bread keeps for days in it; wheat bread kept twice as long in it as just plastic wrapped up breads. Well, no more wheat but I kept some GF Italian bread in it the other week for several days past when it should have gone bad and it was still yummy. You can buy one on the internet; check e-bay. It is worth every penny. I posted a photo of it with my cookie canister the other week. Again, the moister the bread, the quicker it goes bad (mold!) so keep that in mind. I have a loaf of OJ bread stored in my fridge to lengthen its life. I often slice and freeze half of what I made soon after baking so nothing gets wasted…with just me eating them a lot would go bad before I could eat it. I read comments by people just wanting one GF cookie. Freeze a whole bunch and then you can munch them one at a time – actually good advice for any baker. 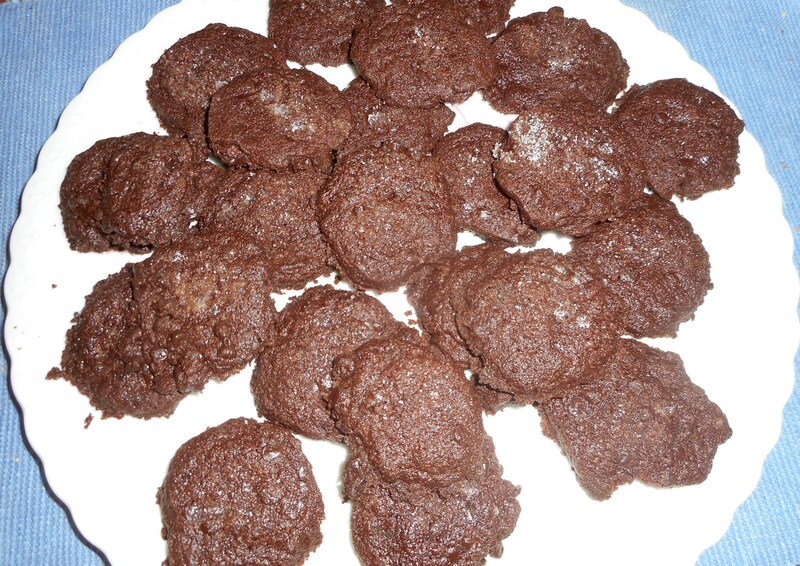 Some cookies are really tasty still frozen; the crunchy texture and unexpected chilly bite is a great treat! Now….if I can just find the right spot to store all my flour mixes….. Originally posted March/April 2013. I reposted this because people new to gluten free baking are asking how to store their flours. Eating Out at Bella’s Is a GF Yumm Fest! Over the Christmas holidays I had a work related supper gathering at Bella’s here in Hellertown. I was glad they chose Bella’s because not many places in the area have an actual gluten free menu. I have eaten there twice in the past year and enjoyed some fantastic shrimp on pasta with a pink vodka sauce. Yes, I got the same thing twice; it was soo good I could not consider anything else on the menu when we went back a few months later. This meal was no exception to the yummy rule. I ordered the gluten free ravioli in the pink vodka sauce with some grilled chicken on top. It was a healthy serving of ravioli, maybe not as extravagant as their linguine serving but plenty of pasta! The sauce was every bit as good as the last two times. I am not a big fan of pink vodka tomato sauce but their chef makes an extraordinary version and so Bella’s is the place where I order that particular pasta sauce. It was full of flavor and smooth and went perfectly with the baked ravioli which were delicious in the traditional cheese ravioli form. The grilled chicken was tasty: in manageable chunks and was cooked properly. There was a good sprinkling of fresh parsley which I appreciated. And the waiter brought the cheese mill and added some fresh grated Romano on top. Grazie! Having enjoyed every bite of this beautifully presented dish I would happily order it again. Next time I will take a picture of the plate before I dig in (to post here!) and take some home as I felt stuffed, like a thanksgiving turkey, after eating the entire entrée. Of course, I also ate a house salad and did have a small complimentary glass of house white wine. The salad was decent and the wine was pretty good. They had a couple of yummy sounding gluten free dessert choices but I was way too full for any of them. Still, it was nice to know there were dessert options if I saved some room for such…next time! I did not have any symptoms after the meal, so it was prepared properly and totally safe, just like the other two meals I ate there in the past year. The service was great, the atmosphere is very comfortable and I highly recommend eating there to all my gluten free friends. They now have some gf pizza on the menu; maybe next time! These simple but delicious chocolate shortbread cookies are amazing: crisp, light and very flavorful because of the double shot of chocolate: cocoa and mini chocolate chips. They are a great way to go when you want to impress company with something understated but totally chocolaty. Great with a cup of hot tea, coffee or better yet cold milk. I saw the recipe in my favorite Annalise Roberts cookbook over a year ago but hadn’t tried making them until this week. I now wish I had baked them long ago as they are addictive! No forming needed for these easy refrigerator cookies. You plop the soft dough onto a piece of wax paper, chill 30 minutes and then scoop the cold dough onto a long piece of plastic wrap, press it into a roll, close the plastic and roll on the table to shape. Chill well and cut the dough into slices, onto the baking sheet, sprinkle with sugar and into the oven. Simple to make and they are perfect for many festive occasions. Beat together the butter and sugar with an electric mixer until light and fluffy, add the vanilla and mix. Mix flours, xanthan gum, cocoa, and salt in small bowl; add to butter/sugar mix. Mix until a soft dough is formed and add the chips; mix in briefly. 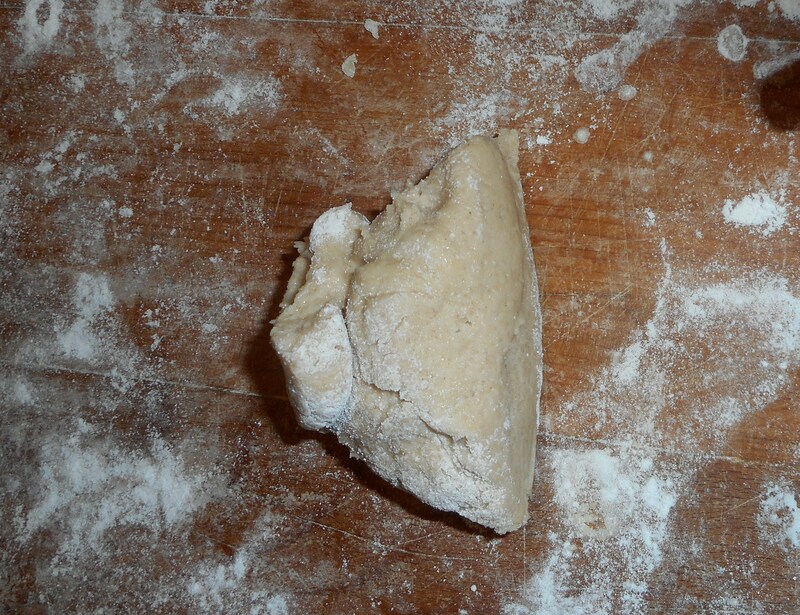 Place the dough in a flat rectangle on some wax paper; chill 30 minutes. 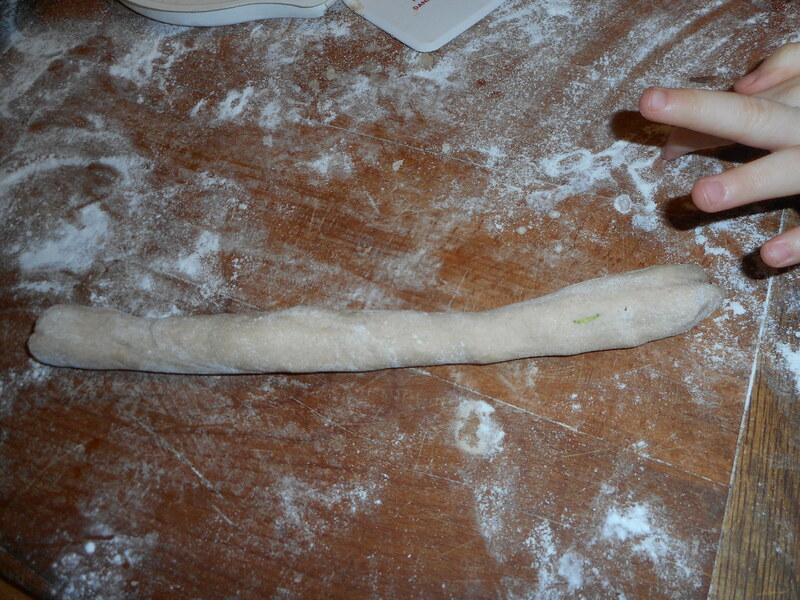 Place lumps of dough in a line along a big sheet of plastic wrap; from it into a 1 ¼ inch log of dough. Twist ends shut, smooth into a round long by rolling it on the table top. Chill it at least an hour; until firm. Heat oven to 350 degrees, move the racks to center of oven. Lightly spray 2 baking sheets with cooking spray. Carefully slice into 1/3 inch rounds. 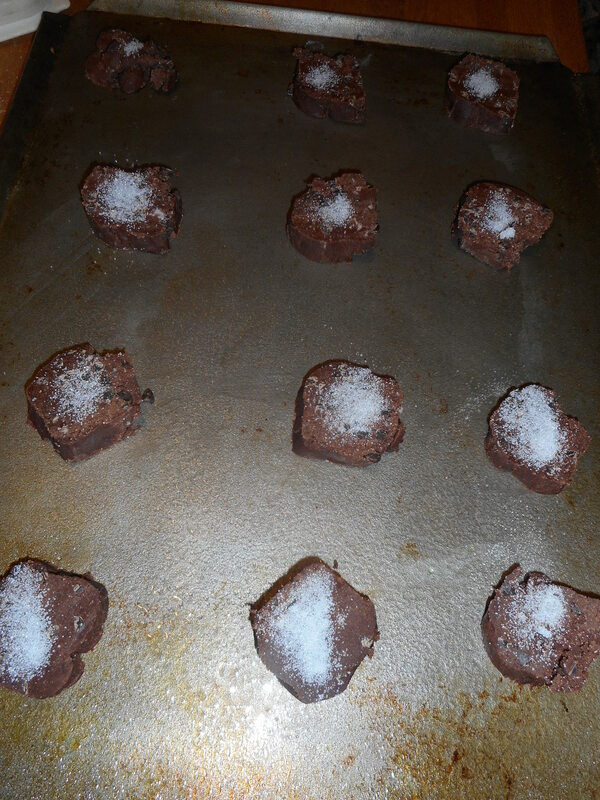 Place 1 ½ inch apart on sheet, sprinkle with a touch of plain sugar. Chill in fridge on cookie sheet for 10 minutes. Bake 10-14 minutes until set. Mine all took 13-14 minutes; I think I cut them a tad thick. Let cool on the cookie sheets 3-5 minutes so they solidify; really delicate until they cool some. When they will hold together, transfer to a cookie cooling rack. Store in airtight cookie jar once cooled. My recipe says the dough can be kept in the fridge for a week or in freezer for up to two months. It made about 25-30 cookies. They are delicately crunchy; if left out in the air unsealed they will get soggy and lose their crisp texture. This recipe is out of Annalise G. Robert’s great cookbook: Gluten Free Baking Classics, second edition.